Derecho, The Sequel: Storm Roars Over Pennsylvania And New York : The Two-Way It didn't leave behind as much destruction or as many downed power lines as the storm that rolled over states from the Midwest through the Mid-Atlantic on June 30, but some news outlets are saying the summer's second derecho struck on Thursday. 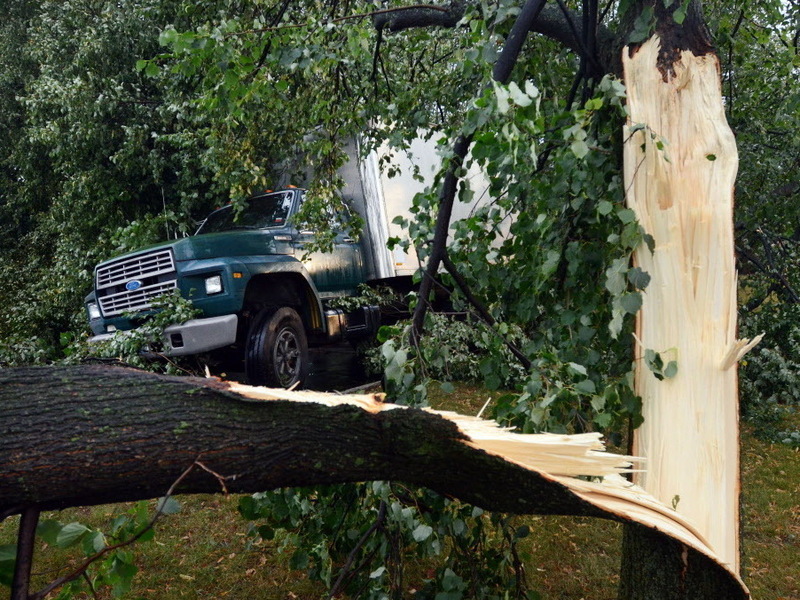 Broken trees lying across a truck in Elmira, N.Y., after Thursday's storm. It didn't leave behind as much destruction or as many downed power lines as the storm that rolled over states from the Midwest through the Mid-Atlantic on June 30, but some news outlets are saying the summer's second derecho struck on Thursday. "Derecho Rolls Through Tri-State," is the headline this morning from NBCNewYork.com, which reports that "Thursday's damaging storms traveled from western Pennsylvania to Long Island's Suffolk County, making a trek of over 240 miles in about five and a half hours." The city that seems to have been hit the hardest is Elmira, N.Y., along the "southern tier" of central New York State, on the border with Pennsylvania. The local Star-Gazette says that "a tornado accompanied by heavy rains ripped through Elmira and the surrounding area Thursday afternoon, knocking down trees and power lines, flooding streets and creating havoc for emergency personnel and city residents." There were no reports of deaths or serious injuries. At one point last evening, as we reported, almost 300,000 customers were without power in New York, Pennsylvania and Ohio. Scott McPartland, who posts at SevereWeatherVideo.com, captured some ominous footage of the clouds over New York's Robert F. Kennedy (Triborough) Bridge. 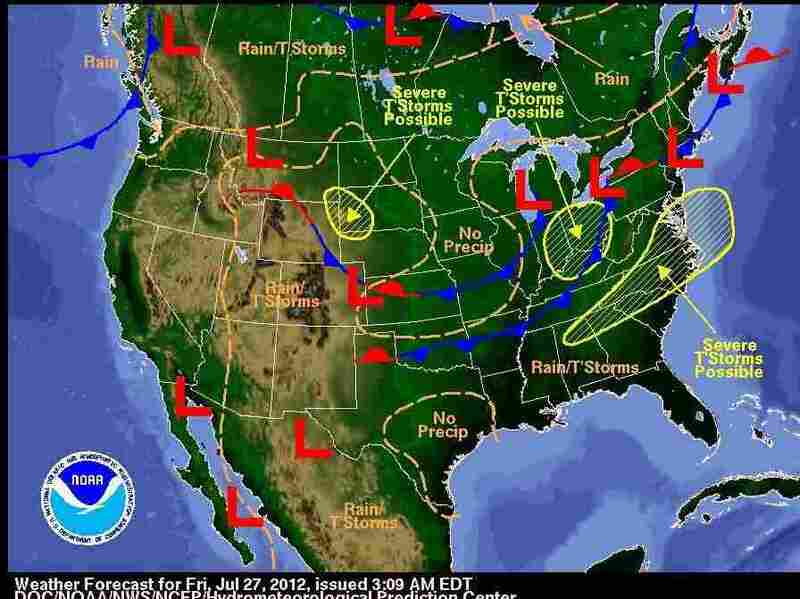 Today, the National Weather Service warns, severe thunderstorms are possible in parts of Indiana, Ohio, Kentucky, West Virginia and along a path from Alabama northeast through to Delaware. Where today's bad weather will be.